I need UI/UX Freelancer to design FULL interface for Android Mobile Antivirus and Optimizer application. Sample of GUI is similar like Mobile Antivirus like CM, BitDefender, Kaspersky and many more. Our corporate color is White, Royal Blue & Grey. 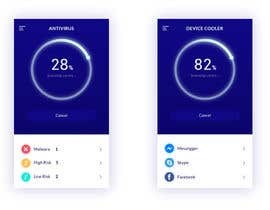 To build a FULL UI/UX INTERFACE, DESIGN of Android Mobile Antivirus & Optimizer Interface Design that will boost the performance of an Android phone. 1) SCAN Android Antiviurs platform. (Scan for Malware). 2) DEVICE COOLER (Cool off your device by finding and stopping the apps that are causing it to overheat). 3) JUNK FILE CLEANING (Delete cache and residual files to reclaim storage, boost speed and improve the performance of your device and SD card. Keep your privacy safe by scrubbing personal info from your device). 4) MEMORY BOOST (Boost your games and apps, free up memory (RAM) and speed up your device. Our 1 Tap Boost and Game Boost features make it easy to optimize directly from your homescreen). 5) CPU BOOST (Calculate how much CPU is being used by apps on your device. Stop apps from wasting battery, slowing down your device and overheating). 5) APP MANAGER (Uninstall unwanted apps or bloatware and back up important ones. Some rooted devices will be able to move apps to the SD card as well as uninstall pre-installed and system apps. Our own Picks section lets you find useful apps that match your interests). 6) CALL AND TEXT FILTER (Filter unwanted calls and text message). 7) LOCK, LOCATE AND WIPE DEVICES (Uninstall unwanted apps or bloatware and back up important ones. Some rooted devices will be able to move apps to the SD card as well as uninstall pre-installed and system apps. Our own Picks section lets you find useful apps that match your interests). Hi! What the final delivery should be? PSD, AI or Sketch? Hi, I need it in PSD. Thanks. What file format should be ? do you need just the mock up design right? I need a UI/UX design for my Apps. Mobile Antivirus Apps. Kindly give more details on what you meant by "mock up"